Dry vegetables are a category of vegetarian recipes prepared without curries. They are a great accompaniment to the lentils and the curry preparations. Dry vegetables are usually made in oil with different spices and herbes without adding water. The basic nature of some vegetables determines the selection of spices, for example, arbi (taro root) is made in carom seeds (ajwain) as it helps in digesting arbi. Pumpkin is made in fenugreek seeds (methi dana) to increase the flavor. Green vegetables are a good source of vitamins, fibers, amino acids, and minerals such as Calcium, Iron, Magnesium, Potassium, Potassium, Zinc etc. Whereas some people drive miles to get fresh, organic green vegetables regularly, others don't know what to do with them :-).. Well, we can make many delicacies from these veggies. From soup to salad, dry vegetables, curries, breads, rice delicacies, and even desserts - plenty of dishes can be made from greens........Greens are really good for our health and we must include them in our diet on daily basis. 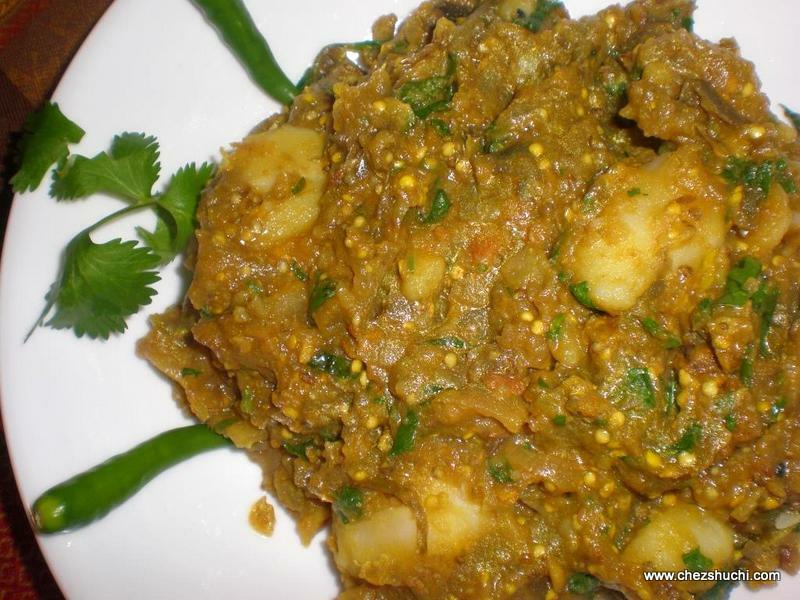 Sarson saag (mustard leaves preparation) is a very famous delicacy from Punjab. This delicious saag is served with makke ki roti (bread made with cornmeal). Sarson ka saag amd makke di roti is a very popular combo in Punjab. Now a days in winter time one can find this combo all the restaurants. There are so many ways to make stuffed bell peppers. When we were kids my mother used to make stuffed bell pepper with potato filling. A South Indian friend of mine makes stuffed bell pepper in peanuts and sesame curry. This stuffed bell pepper's recipe has been adapted from cookery expert Neeta Mehta's recipe with some variations..
Sizzlers are very popular and usually served sizzling hot and smoking in restaurants. Many of our readers have been asking about the ideas to make sizzlers at home. In order to make sizzler at home you need a cast iron pan with a wooden base (This is also known as Mexican Fajita set).. These royal peppers are so yummy. The rich filling of potatoes and paneer makes this dish special and even kids like to try it. I have used home grown sweet peppers for this dish but if you do not find this particular variety use small bell pepper (capscium/ shimla mirch). ..